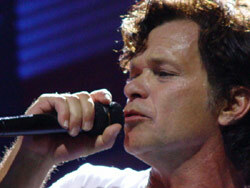 The life, music and art of John Mellencamp will be celebrated at the Rock Hall Of Fame in Cleveland. The special exhibit honoring the Indiana musician opens Thursday (11/10) and includes his 1966 Honda Scrambler motorcycle, handwritten lyrics to the songs Small Town, R.O.C.K. in the USA, Cherry Bomb, Pop Singer and Longest Days, the Dove guitar he played on tours during three decades, concert worn clothing and a half dozen original paintings.